This article is about ambassadors in general. For other uses (including specific types of ambassadors), see Ambassador (disambiguation). 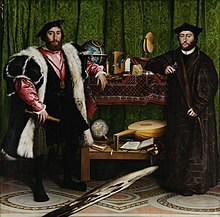 The Ambassadors, 1533. The life-sized panel portrays Jean de Dinteville and Georges de Selve, the ambassadors of Francis I of France. An ambassador is an official envoy, especially a high-ranking diplomat who represents a state and is usually accredited to another sovereign state or to an international organization as the resident representative of their own government or sovereign or appointed for a special and often temporary diplomatic assignment. The word is also often used more liberally for persons who are known, without national appointment, to represent certain professions, activities and fields of endeavor such as sales. An ambassador is the ranking government representative stationed in a foreign capital. The host country typically allows the ambassador control of specific territory called an embassy, whose territory, staff, and vehicles are generally afforded diplomatic immunity in the host country. Under the Vienna Convention on Diplomatic Relations, an ambassador has the highest diplomatic rank. Countries may choose to maintain diplomatic relations at a lower level by appointing a chargé d'affaires in place of an ambassador. The equivalent to an ambassador exchanged among members of the Commonwealth of Nations are known as High Commissioners. The "ambassadors" of the Holy See are known as Papal or Apostolic Nuncios. The foreign government to which an ambassador is assigned must first approve the person. In some cases, the foreign government might reverse its approval by declaring the diplomat a persona non grata, i.e. an unacceptable person. This kind of declaration usually results in recalling the ambassador to their home nation. In accordance with the Congress of Vienna of 1815 and the 1961 Vienna Convention on Diplomatic Relations, the ambassador and embassy staff are granted diplomatic immunity and personal safety while living abroad. Due to the advent of modern technologies, today's world is a much smaller place in relative terms. With this in mind, it is considered important that the nations of the world have at least a small staff living in foreign capitals in order to aid travelers and visitors from their home nation. As an officer of the foreign service, an ambassador is expected to protect the citizens of their home country in the host country. Another result of the increase in foreign travel is the growth of trade between nations. For most countries, the national economy is now part of the global economy. This means increased opportunities to sell and trade with other nations. When two nations are conducting a trade, it is usually advantageous to both parties to have an ambassador and perhaps a small staff living in the other land, where they act as an intermediary between cooperative businesses. One of the cornerstones of foreign diplomatic missions is to work for peace. This task can grow into a fight against international terrorism, the drug trade, international bribery, and human trafficking. Ambassadors help stop these acts, helping people across the globe. These activities are important and sensitive and are usually carried out in coordination with the Defense Ministry of the state (or the Defense Department in the U.S.) and the head of the nation. Before taking office, an ambassador's credentials must be accepted, such as when South African Ambassador Harry Schwarz handed his credentials to U.S. President George H. W. Bush in 1991. The rise of the modern diplomatic system was a product of the Italian Renaissance (from around AD 1300). The use of ambassadors became a political strategy in Italy during the 17th century. The political changes in Italy altered the role of ambassadors in diplomatic affairs. Because many of the states in Italy were small in size, they were particularly vulnerable to larger states. The ambassador system was used to disperse information and to protect the more vulnerable states. This practice then spread to Europe during the Italian Wars. The use and creation of ambassadors during the 15th century in Italy has had long-term effects on Europe and, in turn, the world's diplomatic and political progression. Europe still uses the same terms of ambassador rights as they had established in the 16th century, concerning the rights of the ambassadors in host countries as well as the proper diplomatic procedures. An ambassador was used as a representative of the state in which they are from to negotiate and disseminate information in order to keep peace and establish relationships with other states. This attempt was employed in the effort to maintain peaceful relations with nations and make alliances during difficult times. The use of ambassadors today is widespread. States and non-state actors use diplomatic representatives to deal with any problems that occur within the international system. Ambassadors now normally live overseas or within the country in which it is assigned to for long periods of time so that they are acquainted with the culture and local people. This way they are more politically effective and trusted, enabling them to accomplish goals that their host country desires. Ambassadors are diplomats of the highest rank, formally representing the head of state, with plenipotentiary powers (i.e. full authority to represent the government). In modern usage, most ambassadors on foreign postings as head of mission carry the full title of Ambassador Extraordinary and Plenipotentiary. "Ordinary" ambassadors and non-plenipotentiary status are rarely used, although they may be encountered in certain circumstances. The only difference between an extraordinary ambassador and an ordinary ambassador is that while the former's mission is permanent, the latter serves only for a specific purpose. Among European powers, the ambassador extraordinary and plenipotentiary was historically regarded as the personal representative of the Sovereign. The custom of dispatching ambassadors to the head of state rather than the government has persisted. For example, ambassadors to and from the United Kingdom are accredited to or from the Royal Court of St James's. Ambassadors hold the highest diplomatic rank and have precedence over chargés d'affaires, who are accredited by the foreign minister. Ambassadors also outranked envoys until the 1960s, when the last legations were upgraded to embassies. Because members of the Commonwealth of Nations have or had a common head of state, they do not exchange ambassadors, but instead have High Commissioners, who represent the government, rather than the head of state. The diplomat representing the Holy See is titled a nuncio. In diplomatic usage, both the high commissioner and nuncio are considered equivalent in rank and role to an ambassador. Resident Coordinators within the United Nations system are accredited to the Head of State and have the same rank as ambassador. Ambassadors carry formal letters of credence from their head of state, addressed to the host country's head of state. Because many Commonwealth countries have the same head of state, the accreditation of a High Commissioner is in the form of a simple and often informal letter of introduction from one head of government (Prime Minister) to that of another. The difference in accreditation is also reflected in the formal titles of envoys to foreign and Commonwealth states: e.g., British High Commissioners are formally titled "The High Commissioner for Her Majesty's Government in the United Kingdom", whereas British Ambassadors to foreign countries are known as "Her Britannic Majesty's Ambassador". An ambassador-at-large is a diplomat of the highest rank or a minister who is accredited to represent their country. But unlike the ambassador-in-residence, who is usually limited to a country or embassy, the ambassador-at-large can be appointed to operate in several usually neighbouring countries, a region or sometimes a seat of international organizations such as the United Nations or European Union. In some cases, an ambassador-at-large may even be specifically assigned a role to advise and assist the state or Government in particular issues. Historically, presidents or prime ministers have commissioned special diplomatic envoys for specific assignments, primarily overseas but sometimes also within the country as ambassadors-at-large. While the title generally reflects the ambassador's second head position as head of a diplomatic mission, in some countries the term may also represent a rank held by career diplomats, as a matter of internal promotion, regardless of the posting, and in many national careers it is quite common for them to be appointed to other functions, especially within the ministry/ministries in charge of foreign affairs, in some countries in systematic alternation with actual postings. The formal form of address for an ambassador is generally the form that would be used to address a head of state: "(Your/His/Her) Excellency" followed by name or the country represented. In many countries, less formal variations are frequently used, such as "Ambassador" followed by name, or the name followed by "Ambassador of...". In the United States, "Mister/Madam Ambassador" may be used. The Republic of Kosovo has bestowed the title of honorary ambassador to nine prominent individuals. This is a rare example of an appointment for life by presidential decree of an ambassador by a sovereign state. Honorary ambassadors are entitled to the same precedence and honors as career ambassadors in the Republic of Kosovo. In some countries, a former ambassador may continue to be styled and addressed as ambassador throughout their life (in the United States, "Mr. Ambassador" or "Madam Ambassador" may be heard). In other countries, ambassador is a title that accrues to its holder only with respect to a specific position, and may not be used after leaving or beyond the position. Some countries do not use the term while an ambassador is in the home country, as the office holder is not an ambassador there; for example, a Canadian ambassador while in Canada is not generally addressed as ambassador, although they may be referred to as "Canadian ambassador to ..."; that is, with reference to a specific job function; the person is addressed or styled as ambassador only while holding such office. In a less formal sense, the phrase is used for high-profile non-diplomatic representatives of various entities (rarely states), mainly cultural and charitable organizations, often as willing figureheads to attract media attention; for example, film and pop stars make appeals to the public at large for UNESCO activities (see UNESCO Goodwill Ambassadors), sometimes during press-swarmed visits in the foreign country. In French speaking regions such as metropolitan France, Guadeloupe, Réunion, Quebec, or Wallonia, the title of ambassadeur personne is used. ^ a b c d "Purpose as on web". ^ a b c "Purpose as on web". ^ Leopold Grahame (6 August 1913). "Embassy Councilor; Suggestion to State Department in Regard to Ex-Gov. Lind" (PDF). Query.nytimes.com. Rana, K. (2003). "The 21st Century Ambassador: people who are very important"
Look up ambassador in Wiktionary, the free dictionary.